Research opens many doors. Invariably, there are contents in each report that lead to more questions and the pursuit of more answers. When I first began investigating United Flight 823 I discovered, during a search of an aviation website, that the pilot of Flight 823, Oliver E. Sabatke, was in the site's database. I assumed I was going to find more information regarding the Parrottsville crash. I sent an inquiry with the basic information of the Parrottsville crash. A few hours went by until I received an intriguing response that the website only dealt with military accidents. So, Capt. Sabatke had also been involved in some type of different mishap-apparently while serving as a U.S. Navy pilot. I mailed a check for $14 and waited for a report while finding other things to research. Captain Sabatke was never far from my thoughts as I contemplated just what he was thinking during those last fateful minutes. Then something dawned on me. Captain Sabatke would have reached Douglas Lake (35°57′40″N 83°32′20″W) which is a man-made, forty-four square mile Tennessee Valley Authority lake slightly north of Newport, Tennessee-if he had been able to continue to fly the aircraft westward another four or five miles. A straight line would have taken him there. I'm making the assumption that Captain Sabatke had made prior trips into Knoxville and was acquainted with the topography. Any passenger who has flown into Knoxville has looked out the window and viewed the large waterways that twist through the hills and valleys of Eastern Tennessee. UPDATE: A Crew Report and a Flight Statement show that Captain Sabatke flew Capital Airlines Viscounts from Memphis to La Guardia (Trip#374) and from Memphis to Newark (Trip #270) with stops in Knoxville on June 15, 1958 and May 30, 1958, respectively. Research on this aspect-that Sabatke was familiar with the Knoxville area-is continuing. There was good visibility July 9, 1964. At an altitude of 500 feet, Sabatke would have seen Douglas Lake. The report I had requested was slow in coming and, as I waited, I told myself that if it turned out that Captain Sabatke's 1944 military accident was one that involved him ditching a plane in water, in all likelihood, his final desperate minutes had been spent in an attempt to safely land the plane in Douglas Lake. 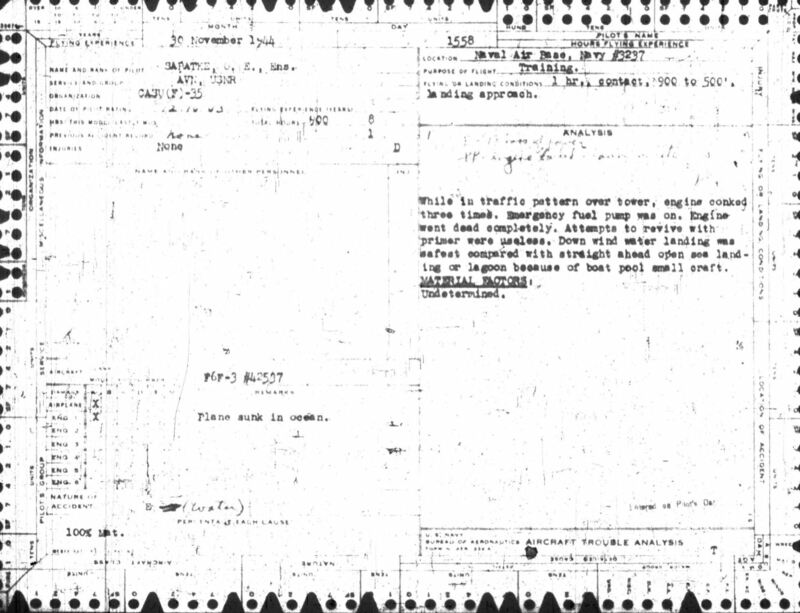 The reason the photocopy was in such poor condition is because the original had been typed in poor conditions. Ensign Sabatke had been flying a training mission in a GrummanF6F-3 Hellcat (#42537) on the Eniwetok Atoll in the Marshall Islands on November 30, 1944. On another section of the report I read the words: “Plane sunk in ocean”. My position on how Captain Sabatke spent his final moments can be described as speculative. I would be the first to admit it. But how far-fetched is it when one considers the survival instinct that is present in humans-especially when one finds himself in such daunting circumstances? Captain Sabatke was presented with a simple case of life or death. How far-fetched is it to conclude that Sabatke would choose survival and life? In the final analysis there is no other way of looking at it-especially in light of the fact that, as a young Ensign, Sabatke had taken the only course that was available to him-finding the best place to land his plane. Copyright 2012 Thomas E. Dier All rights reserved.